The Aga oven is more than a stove, it’s an institution. Think toasty warm kitchens in English country houses, perfect roasts and sponge cakes that defy gravity and it all adds up to the old world charm of the Aga. Whilst people were ripping Agas out of kitchens in the sixties and seventies to make way for modern stoves, they have since had a comeback with celebrities such as Jamie Oliver and Rick Stein singing the praises of this most traditional cooker. Thanks to the Conran Shop there will soon be a whole new generation of Aga lovers. 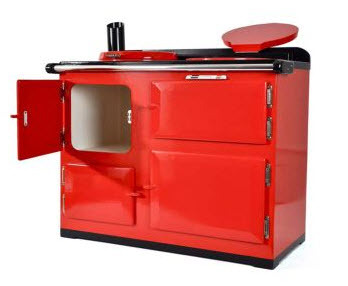 The Mini-Aga has four doors, wooden ‘coal’ and is beautifully finished in glossy red with chrome fixtures. It’s priced at £395 but unfortunately will have to stay in its thoroughly British setting as the Conran Shop does not deliver internationally – oh well, I guess even five-year-olds can have ‘dream’ kitchens.